Performers include: Donal Logue, Michael Raymond-James, Kimberly Quinn, Laura Allen, Rockmond Dunbar, Jamie Denbo, Loren Dean, Zack Silva, Daren Scott, Stephen Frejek, Michael Gaston, Sara Holden, Lauren Holiday, Karina Logue, and Channon Roe. From creator/executive producer Ted Griffin (Ocean’s Eleven) and executive producer Shawn Ryan (The Shield), this comedy-drama revolves around two best friends who work as unorthodox and unlicensed private eyes. Hank Dolworth (Donal Logue) and Britt Pollack (Michael Raymond-James) are best friends who never seem to grow up. Hank’s a tenacious ex-cop and recovering alcoholic who has some questionable morals. Britt is an easy-going dude who loves to drink and used to do break-ins. Hank recognized Brett’s talents and together, they run an unlicensed private investigation business. They don’t get much legitimate business so they’ll take on just about any job, no matter how strange. In this economy, they figure their operation is “too small to fail.” There’s certainly plenty of corruption to uncover in Ocean Beach, California — a community that borders Tijuana, Mexico. Not surprisingly, Hank and Britt have frequent run-ins with the law, including Hanks’ former colleague, Detective Mark Gustafson (Rockmond Dunbar). As such, it’s not uncommon for them to need the help of Hank’s lady attorney, Maggie Lefferts (Jamie Denbo). Kimberly Quinn (Gretchen Dolworth) is Hank’s ex-wife and Katie Nichols (Laura Allen) is Britt’s girlfriend who wants him to settle down and start a family. Terriers: New FX TV Show Debuts; Cancel or Keep It? LOVED this show, just keep checking to see if they have come to their senses and are bringing it back………………………..
Why this show was cancelled is beyond me, this was easily the best of the new shows in 2010. The writing and acting is believeable the storylines are smart and the main characters are appealing and you care about them. Great job FX and you lost me as a viewer too, unless you bring back Terriers. FX COME ON – THIS WAS TERRIFIC- YOU TOOK AWAY DIRT AND THE RICHES – DO NOT TAKE THIS AWAY! Finally a show on FX that is fit to watch (besides Justified). Does FX have no sense whatsoever??? I rarely watch FX as most of the programming is horrible but I really loved Terriers and so did my daughter. We had a long conversation about it. The network needs to give it time to build an audience. I am so tired of reality shows that I could PUKE! and acted. PLEASE BRING TERRIERS BACK! This is a great show! Why is it that everytime I find a really good TV show, it gets cancelled? Not fair. Renew the show, please!!! Absolutely love this show, I really hope FX gives it a chance. I look forward to watching every week. Looking forward to season 2!! Please dont cancel !!! i really hope TERRIERS is renewed. this show got off to a slow start but really picked up by the third episode and has gotten better and better.please RENEW. Finally, a storyline that has some reality as well as fiction. Characters are truly realistic and writing is excellent. Love the current season’s issues and continuing story line. Actors great in their parts. FX should be pushing this show. I don’t believe there’s been enough advertising for the program. It’s good. My nephew likes it, my husband likes, I like it. Two generations here. Give it the credit it deserves and push the show. It’s great. 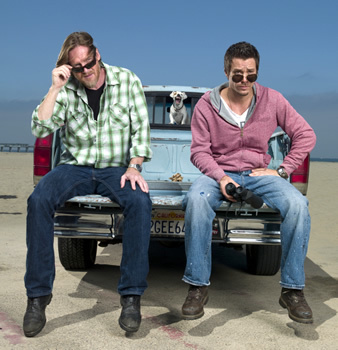 Terriers is just what you want to see – good acting, great characters, banter, sleeze, bromance girlmance, ex-mance. No case too small, working that beautiful stretch of CA – Ocean Beach. I can think of no higher acoylade than to compare this show to the brilliant work of Don Winslow, whose books “The Dawn Patrol,” “The Gentleman’s Hour” “Winter of Frankie Machine” “California Fire and Life” all explore the nether regons of San Diego and Orange County with similar humor and precision. Hope it stays on the air! Terrific show and actors, needs more publicity and network support. One of few ‘best’. I like this show…although I wish they would clean up Donal Logue’s character a bit so that he doesn’t look like a homeless person. Good writing….it’s clever, interesting and the last episode was very heavy. Good stuff!